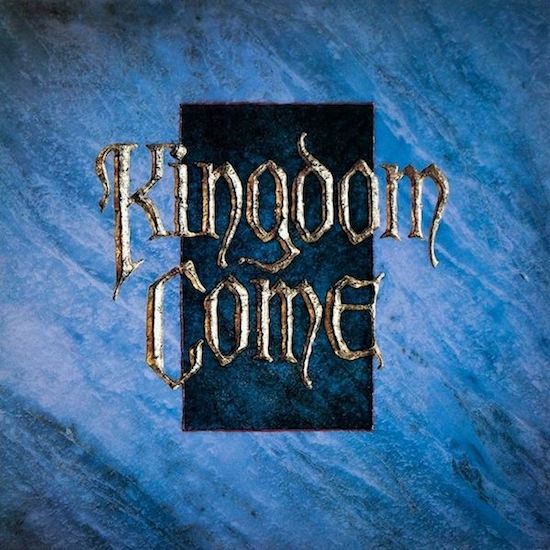 Hard rock band Kingdom Come was formed in 1987 and was quickly signed to Polydor Records. They released their first single Get It On which had a stranglehold on AOR radio in early 1988, prompting their self-titled debut album to ship gold. The quintet, comprised of guitarists Danny Stag and Rick Steier, bassist Johnny B. Frank, drummer James Kottak, and singer Lenny Wolf, took to the road immediately as part of the North American Monsters of Rock”Tour alongside Van Halen, Scorpions, Metallica, and Dokken. In addition to touring and extensive radio airplay, they also became MTV favorites with such videos as Get It On and What Love Can Be helping the band to sell two million debut albums worldwide. Kingdom Come will tour in 2018 – 2019 performing their debut album in its entirety (when headlining) along with music from their second album, In Your Face. Of all the LED ZEPPELIN imposters, these were the guys that took it to the max. Why not? The album ended up being very well produced and the musicians were all quite talented. Now consider that many critics justifiably wrote them off as a gimmick, yet 30 years later here they come. In these last days of heavy metal, I say bring them all back. One more time. Go down swinging boys. The current state of music is so bad, KINGDOM COME might as well be LED ZEPPELIN. That said, the POISON / CHEAP TRICK show that is currently on tour is terrific. Great night all around. Bret Michaels is a man of good character. Anyway, KINGDOM COME came about because WHITESNAKE 87 was a very successful LED ZEPPELIN rip off, then a bunch of famous dudes that looked a hell of a lot like less famous dudes in KINGDOM COME joined WHITESNAKE, then the actual dude from LED ZEPPELIN teamed up with the WHITESNAKE guy and started COVERDALE/PAGE. What the hell?…..And is KINGDOM COME German? Robert Plant should get his revenge against Page and front this new KINGDOM COME. Then KINGDOM COME should throw Plant out and replace him with Axl Rose. Then Axl Rose should reform LED ZEPPELIN with John Sykes and then Coverdale and the KINGDOM COME guys can reform BLUE MURDER and………. Additionally, while I admitted in a previously posted comment, that Whitesnake is definitely influenced by Zeppelin, they are not a Zeppelin clone, like Greta Van Fleet. It is one thing to be influenced by a band, yet still retain your own sound/originality versus sounding almost exactly like said band. Only on a re-read did I see that Lenny won’t be singing! Man, that’s crazy, but a sign of the times. Kottak’s a monster drummer though. I wish Kottak would get on board with Mandy Lion; they could pull in some great bass player and guitarist. “Love You To Death” is one of the best metal songs ever birthed. Mandy can even make a dive club seem like you’re in Road House watching a killer group. Dana was my first concert so I didn’t really notice how bad sound was but Dolken live didn’t t impress me. Since I was born, and bred, in Brooklyn, L’Amour was my sanctuary. I saw only one concert at Studio One and that was L.A. Guns. My boyfriend, at the time, lived in Maplewood, so he took me to the show. He complained about the sound the entire time, but I enjoyed the it-LOL! My first show was Judas Priest Defenders Of The Faith tour at MSG. The infamous performance where the arena got destroyed and Priest was banned for life. Imagine that being your first concert experience…LOL! I was at that KISS reunion tour at MSG too 🙂 Even though I am not a KISS fan, per se, I am happy that I got to see the original lineup perform, makeup and all.